BLE for your Win 10 device. 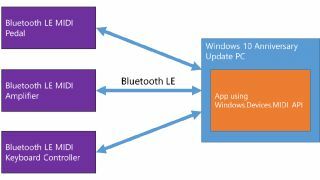 Microsoft has announced it will be rolling out Bluetooth LE MIDI support in the Anniversary Update to Windows 10 for mobile, tablet and PC devices. This newer standard of the Bluetooth protocol aids battery life when you're using supported accessories that don't continuously stream data (such as MIDI keyboards and controllers). It's been native to Apple devices for some time now (since iOS 8 and OSX 10.10). Many new audio enhancements were included in Windows 10, including lower latency on mobile and tablet devices. There was also a new UWP MIDI API, which works with all recognised MIDI devices. Aware that some DAWs are still built on the Win32 platform, Microsoft has also added a Win32 wrapper for the Windows 10 UWP MIDI API. The Win32 Wrapper aims to smooth out the challenges encountered when coding with multiple languages, and is designed to make things easier for developers. If you'd like to know more then check out Windows/PAX Principal Program Manager Pete Brown's blog.